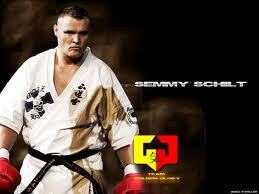 Semmy Schilt is one of the most dominant champions in the history of fightsports. 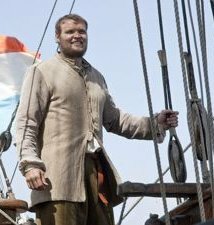 Standing at two-meters-twelve-centimeters and weighing somewhere in the vicinity of one-hundred-and-thirty kilos, he towers over not only his opponents, but also, the history of the sport itself. JARROD BOYLE goes to the mountain and comes back with the news. How many fights have you had now, Semmy? Fifty kickboxing fights and forty MMA. How did you become involved in the martial arts? I believe both of your parents are involved in martial arts? I did Kyokushin Karate when I was younger. Both my parents were doing it, but just for recreation, not competition. I started when I was eight. Were you bigger than the other kids at that age? Not so much. I was probably a little bit bigger. When I went through puberty, I became a lot bigger. Then, later, I grew again. But at eight, I was not particularly big for my age. Are both your parents tall people? What did they think about your fighting? They always supported me, but mum doesn’t like it too much! Dad watches. He’s always at big tournaments. Since I went onto K1, I’ve involved my father a lot. It is said that height and reach is a great advantage, but it is not easy to learn how to use them. Did you struggle to learn to properly use your size? With karate, it was okay. But when I started boxing at eighteen, it was difficult to use my distance. They always come close, when they fight. You just do it and concentrate on keeping distance. You seem to have the hang of that with your push kicks. I started a little bit late with push kicks. When I was free-fighting, I did not use much push kicks. I started to use them in Pancrase, and then in kickboxing I used them more. How did Karate provide a grounding for you as a fighter? Basically, it’s the mental discipline. It makes you the fighter that you are. I got my black belt when I was eighteen, back in 1993. I don’t practice so much, but I still teach. Did it develop your sense of sportsmanship? 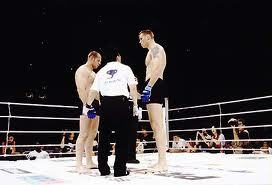 In my opinion, you have to have respect for your opponent. Without a good opponent, you cannot win. He has to respect you, because he cannot win without you. Do you still wear the gi and run through the forest barefoot, like in the K1 pre-fight footage? The Japanese love that! When I train kickboxing, I wear shorts. It’s not important to wear the gi. My style is karate; it’s in my heart. How did you become involved in MMA? Actually, I did a karate tournament. The style of karate – Gai Do Yuko – fights on the ground, also. You wear helmets and fight on the ground. That’s how I got ground techniques. When I was twenty-one, I did some judo. I won the Japanese tournament and became champion in that style. I was the first non-Japanese to win in eighteen years. From there, Yamata was in the audience. At that time, he was fighting for Pancrase. He said he couldn’t fight me because I wasn’t MMA. From that moment, I went into MMA. Why did you return to ‘pure’ kickboxing? Before K1, I never kickboxed. I didn’t like it too much, either. I preferred groundwork. At that time, K1 had problems with Pride. They did an exchange, so I could fight in either. Then, they had a conflict, and I couldn’t do either. My management said they thought it was better to do kickboxing, back in 2002. I only had a few MMA fights. You had a successful career in MMA, but weren’t as dominant as you were in kickboxing. Why do you think that is? My body is made for kickboxing and karate. I have an athletic build. A wrestler needs to be more compact. There was a time when I wished I was about 198 centimeters and 130 kilograms! All my kickboxing strategy is built on my size. Have you done much boxing? No. Never competed. I did not have the opportunity to do so. In karate, then kickboxing; boxing was not a logical step. I did some training when I was 19, but never to fight. When did you begin training with Golden Glory? I think I started at Golden Glory in 2000. I started with Dave [Jonkers] when I was 19. They contacted me, because they were establishing a team. They said, ‘You’re going to earn five times as much money as you do now.’ I wasn’t sure I liked that. I don’t like people who talk about money; I try to keep distance from those guys. Rolexes and gold chains. Then, they persuade me, you know? I was ‘King of Pancrase’ and found I was stuck. My management transferred me to the UFC. You have had a long and successful relationship with Dave Jonkers. What is it that makes him such a good trainer? I believe he is excellent at analyzing my opponents. When I have to go for a fight, I know my opponent. The game plan is always in place. He’s never got it wrong. In the last three years, it’s become more routine. ‘You know what to do,’ he says. Before that, Dave analyzed and predicted everything. How do you structure your training? Do you train twice a day? How do you achieve such an exceptional level of fitness? I used to train twice. I train only in the morning now. Before the K1 GP I would train twice a day. The last four or five weeks I’ve been training twice a day. In the morning I eat and go to gym for kickbox training. Bags, pads, drills with partners for one hour. After that, I do weight training. I stick to what’s traditional and basic. Sometimes I also take the cardio after that. Then, in the afternoon, only cardio. What was your experience of K1 management? What were they like to deal with as a corporation? Very difficult for me, I think. They could have built me much more than they did. 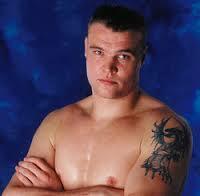 They held onto Aerts, Hoost, Bonjansky; old champions. 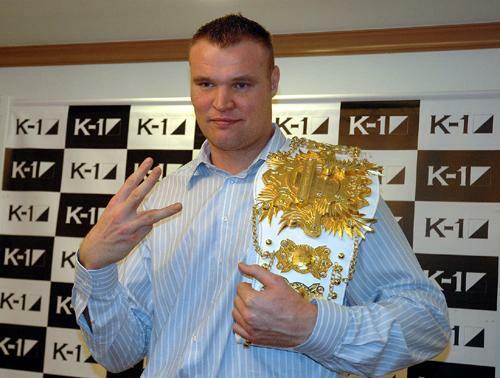 When I first came, it was Pride vs. K1. [They] never took me into the family. Also, they never contacted me after FEG went broke. They could have said something, I think. What was it like fighting Errol Zimmerman, as your team-mate? You must have known him from a very young man. I never made a lot of contact with the Golden Glory team. I knew they were heavyweights and I’d have to fight them, so I didn’t want to get to close to them. It makes it harder to fight them if you like them. I notice that Alexei Ignashov was your first loss. What was the fight like? What is your opinion of him as a fighter? That fight was also in Holland. I didn’t want to fight that time. He was known for his knees. I had to fight in the ‘It’s Showtime’ organization, which was the same [problem] as before. I didn’t connect so well with Showtime. A lot of bad influences. I was really pissed off about that; that I lost. You have had an enormously successful career. Are there any other goals for you to still attain? Yeah, of course! I want to be as successful an actor or a businessman. There are many ways to be successful. I want to be a good father for my son; a good husband to my wife. Myself. I’m the opponent. Before the fight, getting nervous, I’m the worst opponent. Once the fight arrives, it’s okay. But before that, I am hard on myself. What are your plans for after kickboxing? I hope I can do some movie things. Like Schwarzenegger and Stallone. Of course, the gym, also. I want the gym to be successful. How did Ramon’s death affect you? Me personally, it affected me a bit. I got to know him after his career. During it, I didn’t know him. In 2000, when I got into Golden Glory, I got to know him. I wanted to take an example from him and the things that he did. He always did seminars; talked about how he did what he did. I think me and Ramon connected. He was a bit like an invisible man; he is there, but he stays in the background. The funeral was massive. It really touched me. At that moment, you feel vulnerable. You imagine, ‘It could have been me’. Have the UFC come knocking? It’s a very big organization. I have not had an offer as yet. People are talking, though. Dana White has not contacted my management. I think he thinks I’m a little bit too heavy for the UFC! This entry was posted on July 5, 2013 at 11:05 pm and is filed under Kickboxing with tags Alexei Ignashov, Arnold Schwarzenegger, Boxing, Dana White, Dave Jonkers, Ernesto Hoost, Errol Zimmerman, FEG, Gai Do Yoku karate, Golden Glory, Judo, K1, Kickboxing, Kyokushin karate, MMA, Pancrase, Peter Aerts, Pride, Ramon Dekkers, Remy Bonjasky, Rolex, Sylvester Stallone, UFC, wrestling, Yamata. You can follow any responses to this entry through the RSS 2.0 feed. You can leave a response, or trackback from your own site.